The city of Aspen intends to hold at least one public meeting on the conditional water rights it holds for two large dams, one on upper Castle Creek and one on upper Maroon Creek, shown here in this 2012 file photo, with the Maroon Bells visible in the background. The dam on Maroon Creek would be 155-feet-tall and store 4,567 acre-feet of water. ASPEN – Officials at the city of Aspen intend to hold at least one public meeting this summer to discuss the conditional water rights it holds that are tied to potential dams on upper Castle and Maroon creeks. The city’s next diligence filing for its conditional water rights for the two dams and reservoirs is due in Division 5 water court in Glenwood Springs by Oct. 31. It’s highly unusual in Colorado for a city, or any other entity, to hold a public meeting on a pending diligence filing. David Hornbacher, city of Aspen director of utilities and environmental initiatives, said that while holding a public meeting is indeed “different,” he is acting at the direction of the city council. Paul Noto, a water attorney with Patrick, Miller and Noto, which specializes in water law and has represented many clients in the Roaring Fork River watershed, said it was “very unusual” for a city to hold a public hearing about a pending diligence filing. A rendering from Wilderness Workshop showing the potential Castle Creek Reservoir. The rendering was developed by a professional hydrologist and is based on engineering plans filed by the city. 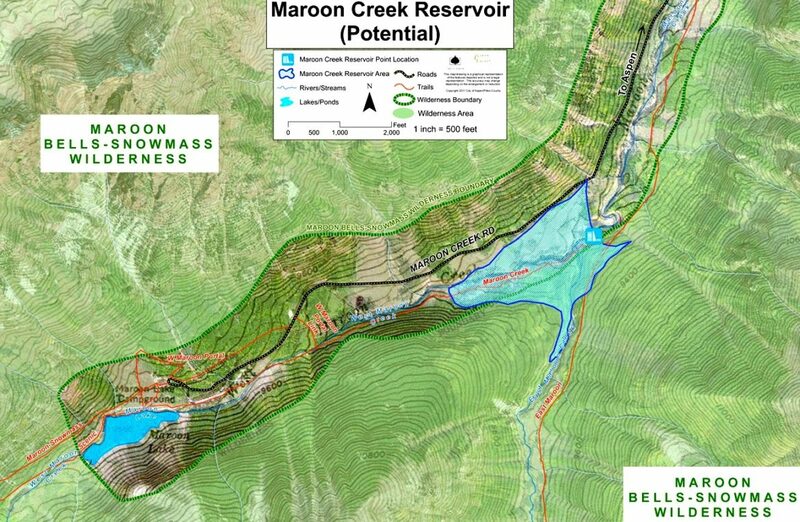 If built as currently described by the city’s plans, which were first presented to a water court judge in 1965, the Maroon Creek reservoir would store 4,567 acre-feet of water behind a 155-foot-tall dam just below the confluence of East Maroon and West Maroon creeks. While only about a third of the size of Paonia Reservoir, which can hold 15,553 acre-feet when full, a Maroon Creek reservoir would still cover 85 acres of U.S. Forest Service land about a mile-and-a-half below Maroon Lake. It would also inundate portions of both the East Maroon Creek and West Maroon Creek trails in the Maroon Bells-Snowmass Wilderness. 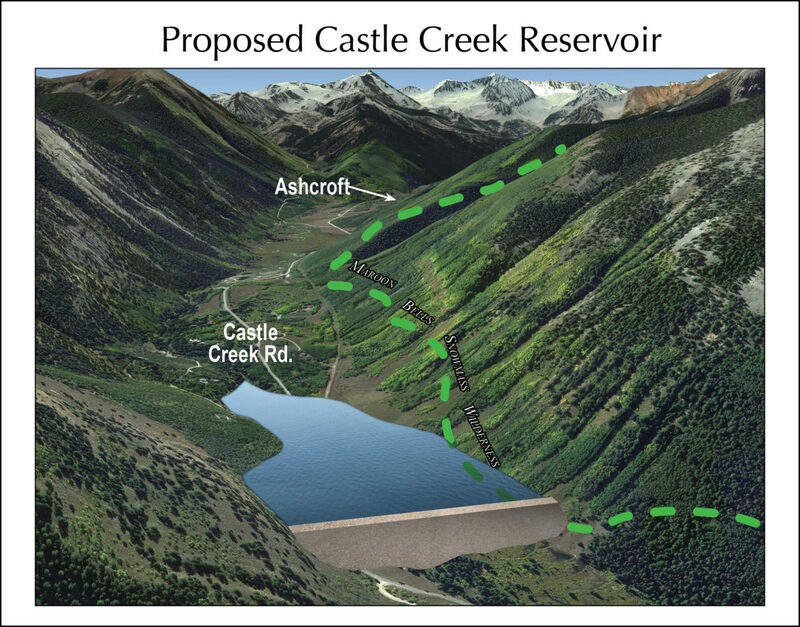 The Castle Creek reservoir would hold 9,062 acre-feet of water behind a 170-foot-tall dam located about two miles below the historic town site of Ashcroft. It would inundate 120 acres of mostly private land between Fall Creek and Sandy Creek and flood a small piece of Forest Service land within the Maroon Bells-Snowmass Wilderness. Both reservoirs would be located in Pitkin County. A court official, known as a water referee, agreed. 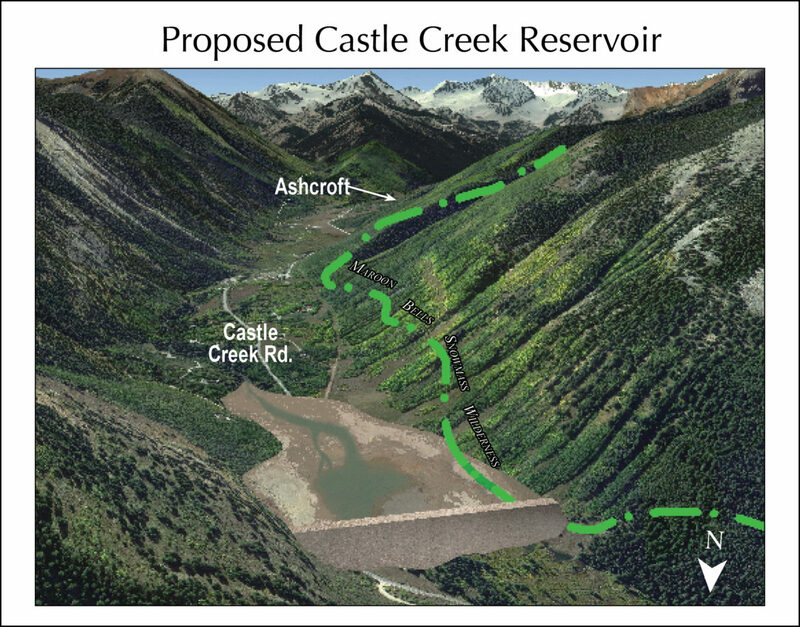 A rendering from Wilderness Workshop showing how a Castle Creek Reservoir might look on a seasonal basis after water has been drawn down to meet downstream needs. After presenting information about the water rights and taking questions and suggestions at the meetings, Hornbacher said he would report back to the council in a work session in August or September to get its direction by the Oct. 31 filing deadline. He said council could direct staff to proceed with the diligence filing and try and keep the water rights on the books for another six years. Or it could direct staff not to file, or to file a modified application. Hornbacher said a modified application could mean filing on one dam and reservoir, but not both, or it could mean filing on both reservoirs but changing their size and shape. It’s not unheard of for entities to walk away from conditional water rights. The Colorado River District made the decision to abandon rights for two large dams on the Crystal River in 2013. And over the last five years, the district has stepped away from a number of other conditional water rights. Among the stakeholders Hornbacher plans to invite to a private meeting are Wilderness Workshop, Roaring Fork Conservancy, U.S. Forest Service, and Pitkin County. Typically, owners of conditional water rights need to demonstrate to the court they meet the “can and will” doctrine – that they can build the proposed water supply project and that they will build it. The city may also need to meet standards developing in the wake of a Colorado Supreme Court decision in Pagosa Area Water & Sanitation Dist. v. Trout Unlimited. “The applicant must demonstrate the proposed appropriation can and will be diverted and put to beneficial use for each of the proposed uses: a) within a reasonable planning period; b) using normal population growth assumptions; and c) the amount claimed is necessary and unappropriated water is available,” Martellaro wrote. In past filings, the city has left the state with the distinct impression that it intends to build the two reservoirs, especially in the face of the uncertainty of climate change. But it has also left citizens with another impression – that it is simply protecting its water rights, not warming up bulldozers in view of the Bells. Noto has represented clients in the past who successfully opposed the city’s proposed hydropower plant on Castle Creek, but said he is not currently representing a client regarding the city’s pending diligence filing. As such, Noto was willing to talk on the record in the role of citizen and as an experienced local water attorney. He said he doesn’t agree with the city’s reasoning that a hotter future may increase the need for the reservoirs. The city of Aspen recently completed a raw water availability study that concluded that Aspen has sufficient water to meet future municipal demands, but in one of out of 20 years it might have trouble meeting its goal of keeping instream flows of at least 14 cfs in Maroon Creek and 13.3 cfs in Castle Creek. The language in the water availability study leaves open the door for the city to suggest that building dams on the upper sections of the creeks could help meet its in-stream flow goals on the lower sections of the creeks. A map produced by Pitkin County from a map on file with the state of the city of Aspen’s proposed Maroon Creek Reservoir, located just below Maroon Creek Lake, shown to the left as the smaller of the two bodies of water. The map was commissioned by Aspen Journalism and confirmed in 2012 as accurate by city officials. Noto was asked if he could see a reason why the city should hold on to its conditional water rights on Castle and Maroon creeks. American Rivers is also on the record as opposing the city’s plans to build dams and reservoirs. 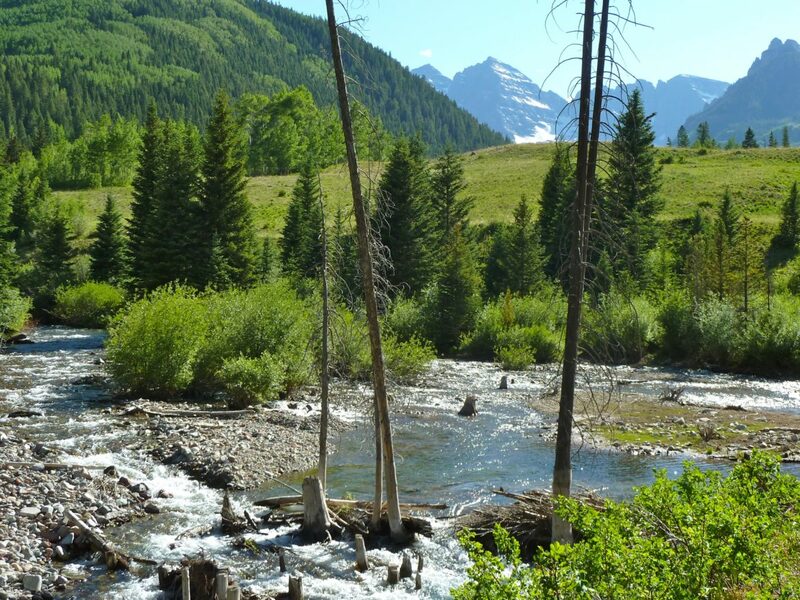 American Rivers is a national nonprofit dedicated to river restoration and protection, which fought vigorously against the city of Aspen’s Castle Creek hydro power plant. Rice said whether or not American Rivers will oppose the city in water court if it does decide to file a diligence application is a strategic decision to be made down the road. Editor’s note: Aspen Journalism and the Aspen Daily News are collaborating on the coverage of rivers and water. The Daily News published this story on Monday, June 20, 2016.